Rohan Tungate in action for Panthers against Belle Vue on Monday. Tungate rode for the Aces last season and Panthers co-promoter Colin Pratt said: “Rohan knows their track inside out having joined us from there in the off season and he will be keen to put on a good show. Panthers were beaten 48-42 by Belle Vue in the same competition in Monday’s first meeting of the season at the East of England Arena. Once again fans will have the opportunity to vote for the riders they want to see in Heat 14 via the club’s official twitter feed. 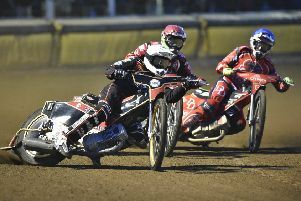 A choice of four riders will be posted on a poll after Heat 10 for 15 minutes and those selected won’t be eligible for the final race.